Vcore modded to 1.35v, mem to 1.25v. bios to 760/1150. It is stable all day long at 820/1150. Ready for watercooling, add your block. The heatsinks, ram and VRM are expoxyed on. Comes with all accesories and original heatsink/fan. I bought a GTX 260 on Friday. Vmodded and watercooled it to the moon, don't need this now. Original intent was to xfire, I bought another 4850 and found out my mobo was only x4 lanes on the second pci-e slot and totally sucked at xfire. Last edited by Squeetard; November 23, 2008 at 03:35 PM. bump for an awesome card! To bad about the slot. Off topic but a free bump... how hard it the GTX 260 to vmod? Can it be done with pencil or is solder the only solution? i may be interested. just wondering how easy it was to volt mod it though, because i would eventually get a second i imagine. 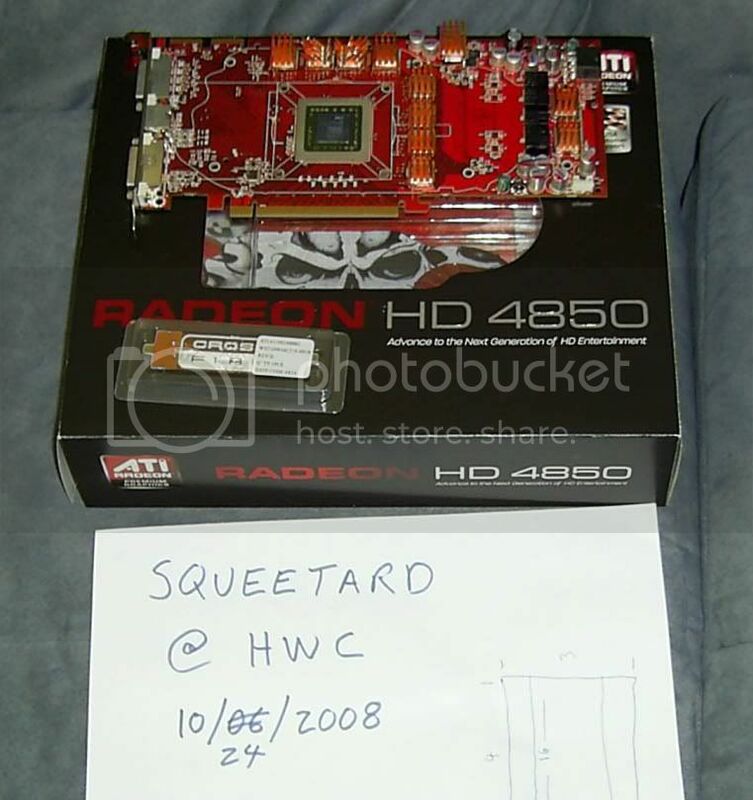 you still have the other 4850 as well? Easy to volt mod. Look on the 'tech powerup' (makers of GPU-Z) forums. I returned the second card for full refund after trying for 2 days to get some xfire performance out of my board. Never touched the second card. the gtx 260 can be done in the bios, beautiful eh? You use nibitor to edit your bios and flash it back on. I'm stable at 837/1674/1260. Without ramsinks on as yet. When you say "Vcore modded to 1.35v, mem to 1.25v" what exactly do you mean? Do you have a trimpot on there or a fixed resistor or penciled or what? Do you have an unlocked BIOS flashed? Pencil mod, was the easiest. Stable for 2 months, I checked the voltages periodically. Grabbed an unlocked bios and changed the clock values (for the high performance 3d mode only)and flashed it. Ok seems like a good deal then other than the epoxy. It really makes it tough if your block doesnt fit or you want to air cool. I ruined cards in the past trying to get that stuff off, never again. I had no luck with the thermal tape. Always had blocks falling off. Had one fall onto and kill my x-fi that was in the slot below. I've removed them before with care, but it is pointless with the voltages and modded bios on this card.